The Shaker community was located on the southwestern part of Sodus Bay in what is now called Shaker Heights. Another lasting legacy of their religious movement is Ann Lee Drive which was named after the founder of the American movement. 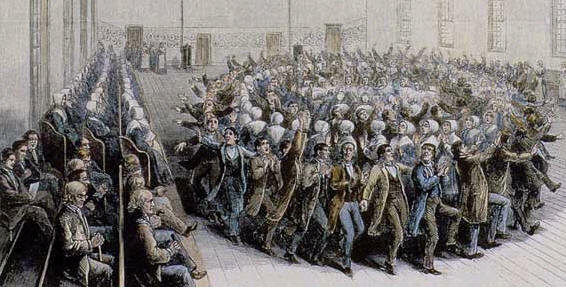 The Shaker religion has fascinated Americans ever since its inception in the late 1700s, one of the longest surviving of the “new religions” which were to develop in the United States. It spread at its zenith by establishing communities from Maine through New England to New York to Ohio and to Kentucky. In New York State in the “Burned-Over District” of central New York, a Shaker community was begun in 1826 at Sodus Bay on Lake Ontario, a community which would relocate to Groveland to the south of the Finger Lakes area after a few years. The Shaker faith had its incipient beginnings in England in the mid-1700s, but it was Ann Lee, born in 1736, who was to found the ongoing faith in America once she left England. Ann Lee came from an impoverished background, she never learned to read or write, and she was forced to work at menial tasks all of her life. She married unhappily and had four children all of whom died young. Open to “heavenly visions” which brought her new truths, she came to abhor “the depravity of human nature and the odiousness of sin,” particularly the act of sexual relations. These concepts from her occult occasions became imbued in her mind and were to influence the years of her adult life. In 1758 she was converted by James and Jane Wardley, Quakers, who were the followers of a small group of French religionists who had taken refuge in England from persecution in France due to their beliefs. These French peasants claimed to have been inspired in their native land by the Holy Ghost, and they wished to return to the forms of primitive Christianity as they viewed that early faith. In their religiosity they were subject to trembling, fainting, trances, and given to visions and prophecies. They looked forward to the imminent Millennium, and they had gifts of speaking in tongues and of healing. Relentlessly persecuted by the French Church and government, their survivors in England had few followers. City, once more working at menial tasks. In the New World her husband deserted her for another woman, and Ann eventually followed her colleagues to Niskayuna where they had prepared a refuge for her and for themselves in which they could follow their own faith. not constitute a theology nor an organized pattern for a religious following. Fortunately, in 1787 two natural leaders arose out of Mother Ann’s small group, Elder Joseph Meachum and Eldress Lucy Wright, and they were able to organize and systematize Mother Ann’s teachings into a way of life for a celibate religious society which was to grow and to flourish. As Shaker theology developed, God was seen as having a dual personality which encompassed both the masculine and feminine aspects of being. In Jesus, the masculine side had been made incarnate, and in the fullness of time the female aspect of the divine would also become incarnate—as had occurred in the person of Mother Ann. As with many groups touched by the revivalism of the age, the Biblical books of Prophecy and Revelation were the foundation of their beliefs, to which was added their abhorrence of “carnal sin”—and thus the doctrine of celibacy became a cornerstone of their faith. In this life, they felt, there was the need to perfect oneself, and this was the goal for Shaker members who would work for the ultimate salvation of their own souls and for all other souls as well. In the developing Shaker villages, individual “Families” were established of celibate men and women in separate quarters where they worked to support their existence, each “Family” having its own dwelling house from which the combined members could farm and could work at the hand industries which supported their endeavors. A surge of religious revivals in Ohio and Kentucky soon proved fertile ground for the spread of Shakerism beyond the New England and eastern New York State areas. A Shaker community had been founded in Lebanon, Ohio, and then one in Pleasant Hill, Kentucky. Among the early converts to the Ohio Shakers was Richard Pelham who joined the Shaker’s Union Village in Lebanon, Ohio, and he was to become a leader of that community. In 1824 he returned to New York State to visit his brother Joseph in the Lyons, New York, area, and he talked his brother into visiting Union Village to see the new life which one could experience as a Shaker. Joseph Pelham was not only intrigued by the life he saw at Union Village, but he, and then his wife, converted to the faith. Born in 1792 and married in 1813, Joseph and his wife Susanna now became convinced that the Shaker way of life was the only true calling, and thus they petitioned the Shaker Central Ministry at New Lebanon, New York, for the creation of a celibate Shaker community in western New York with Joseph as its leader and with their support. The Central Ministry sent a delegation to survey the situation, and they found the rich farmland and the cover of timber in the Sodus Bay area at Lake Ontario such as could support a new community. A community at Sodus Bay offered another benefit, for it could serve as a way-station for those Shakers who traveled on religious business to the Shaker communities in Ohio and Kentucky. Therefore private funds were solicited and money was borrowed from the Massachusetts and New Hampshire Shaker units to purchase 1,331 acres of land for $12,600. Four Shaker “Families” and a leader were sent from the New Lebanon Ministry to Sodus Bay to create the new community. When the new Shaker Sodus Bay unit was organized in March of 1826, it numbered seventy-two members, growing over the next nine years to one hundred and fifty members. It would be the last, long-lived Shaker community established, existing until 1892 when it was dissolved. The land which was purchased held several farm houses, a grist mill, and barns, and the new group thus had a basis for the establishment of a Shaker village. A meeting house arose in 1830-31 and then a large dwelling house for the first “Family” in 1833-35. What seemed a successful and prosperous establishment with thirteen houses and ten barns would be threatened by the internal improvements which New York State was pursuing in order to serve the farms and nascent industries of western New York. In 1836 the State proposed the creation of the Sodus Canal Company, and, with the State’s right of eminent domain, it seemed that the canal would go right through the Shaker lands. The community therefore decided to sell its land in November of 1836, and 1,692 acres of farmland were purchased in Groveland, New York, fifty miles to the southeast, for $55 an acre. Over the next twenty-four months all the members, the community’s property and livestock, and even the bodies of its deceased members were moved across New York State to their new home. The move was not an easy one, for the housing in Groveland at first consisted of log cabins and one farm house, but by June 1838 the relocation had been completed.